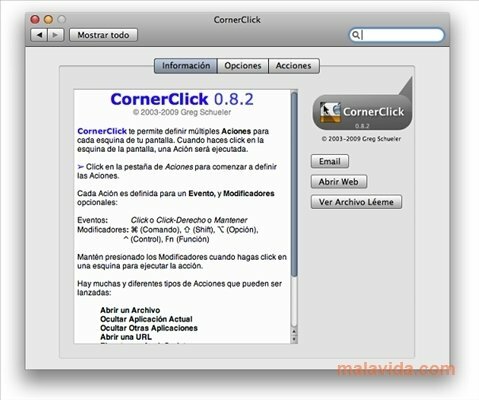 Mac Operating Systems use a user-friendly interface, where almost even the slightest detail has been taken into account when in comes to making things easier, but there are still some improvements that can be implemented, like those CornerClick presents. This simple application is a Preference panel that offers us the possibility to assign an action to each corner of the screen. These actions can be: Open a file, hide the current application, or other applications, open a URL, run an AppleScript (this multiplies our possibilities) or various Exposé actions (we'll only have to make sure of assigning each Exposé action an F-key). Each corner can have multiple actions assigned to it that are run if we assign one or several keys to an action, so we could run one action by pressing shift, command, option, control or Fn and clicking, or activate another action by combining two or more of these keys. Your productivity is sure to increase if you use CornerClick, because once you get used to using these shortcuts, any task will be much easier to accomplish.